* Note: this custom table is usually available to ship within 2-3 weeks. 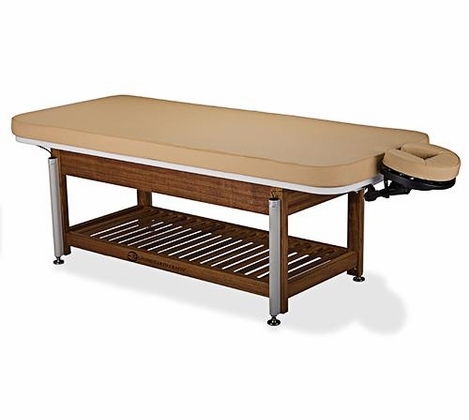 The Napa La Mer wet treatment table by Living Earth Crafts is beautiful and durable with a limited lifetime warranty. 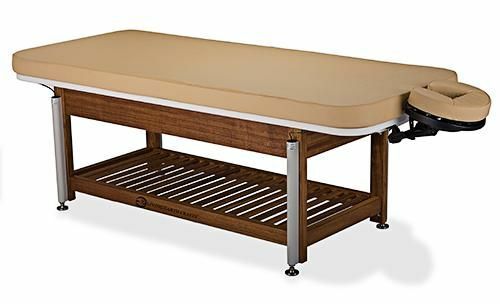 This spa table from our Living Earth Crafts collection at MassageTools has water-resistant upholstery and a water-resistant teak base with a slotted shelf. This non-electric table with stainless steel hardware operates with a manual hydraulic lift system with a foldaway handle. It's the perfect salon top treatment table for massages, Vichy showers, body wraps, mud masques and scrub treatments. The ultra-comfortable upholstered top is designed to drain liquids, and it's removable for periodic disinfecting. With a lift capacity of 500 pounds, this 70.25-inch by 29-inch teak spa table has a height adjustment range of 25 inches to 37 inches. � Height Range: 25" - 37"